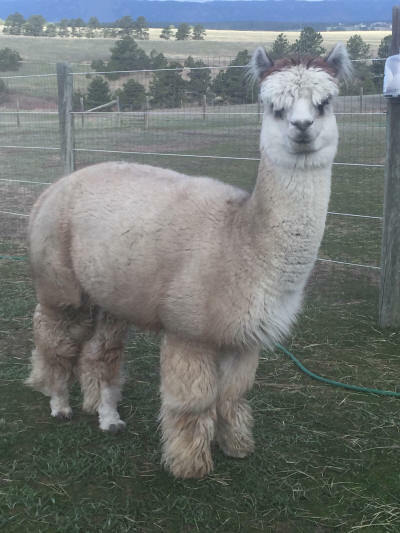 Alpacas and Alpacas For Sale at Xanadu Farm Alpacas - Xanadua Moms! 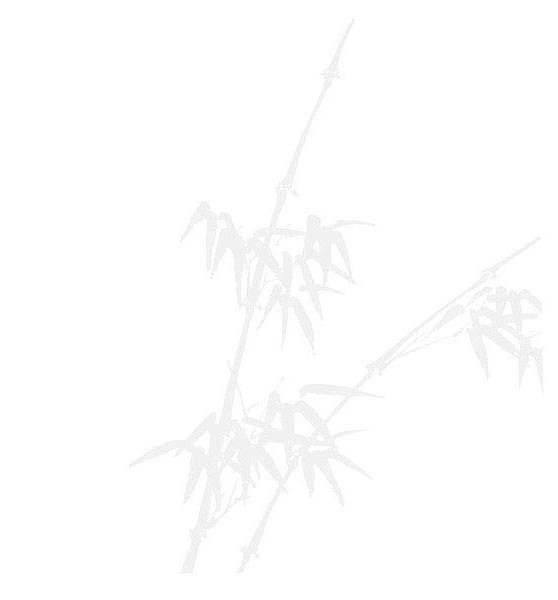 This is the most important page of our website. 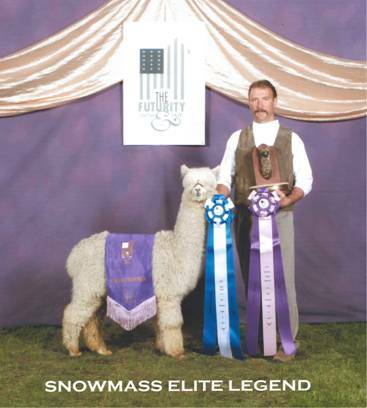 You can see the depth and success of our 25+ year breeding program right here. Our full Peruvian moms are the secret to our success. 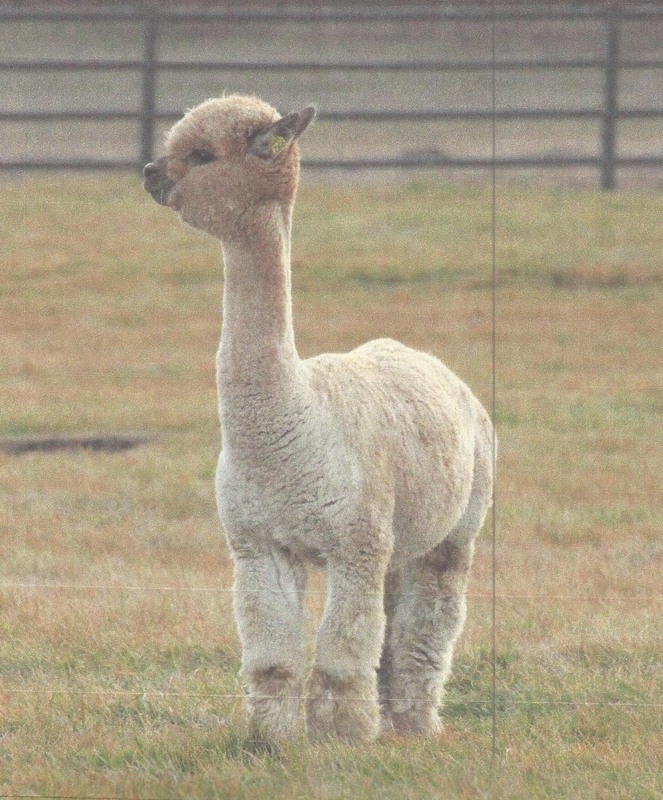 Photos and show records of all 21 moms and all of their crias are here. 5 Moms are Judge’s Choice Winners. We've honored the 15 mom's who have given us 4 or more offspring as our "Xanadu Heirloom Moms" . 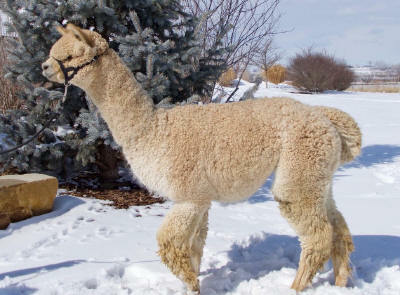 Take a look at our Annual Investment Package sale on the Alpacas for Sale page. 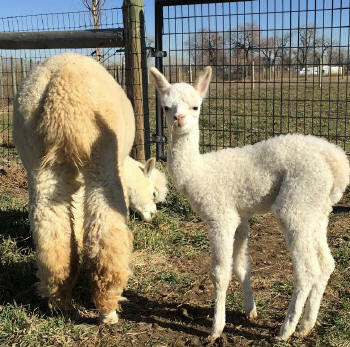 Most of our sale alpacas come from these Moms and many of their offspring are for sale. Comments: Just old enough to show at GWAS & took 1st of 12 in walking fleece. Highly evolved architecture, bright and very fine. 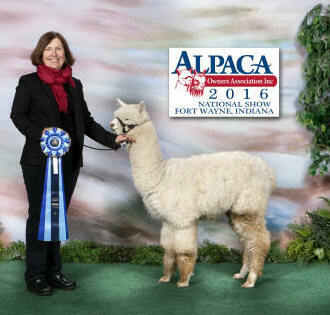 1st Place & Champion Walking Fleece (group of 36), 1st Place & Color Champion Halter, ’18 MoPaca Show, 1st and RC ’19 TxOlan fleece show. 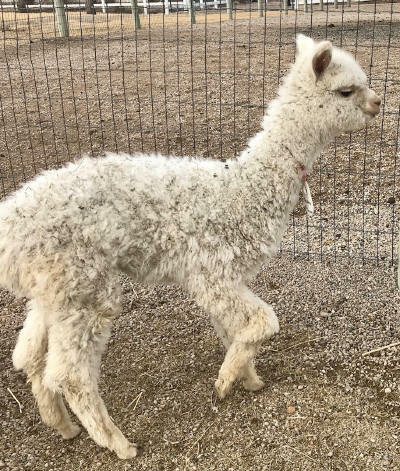 Breeding Status: Bred to Xanadu P Alchemist for a fall 2019 cria. 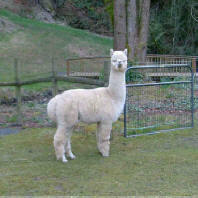 Comments: Haven earned her way into our foundation herd with her 1st two crias. They're extraordinary & confirm her place with our best. 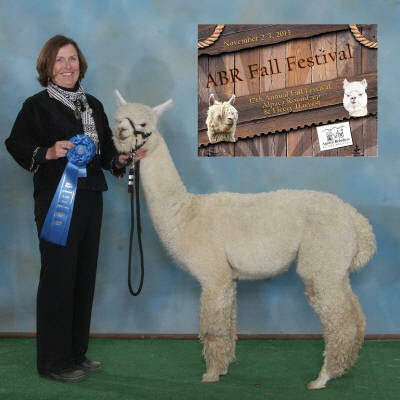 1st Cria - Xanadu P Descant [Rocky Bay son] 1st and RC '15 GWAS, [@ 6 months in group of 40] 1st & Color Champion ABR Fall Fest & A-OK Blastoff Show. 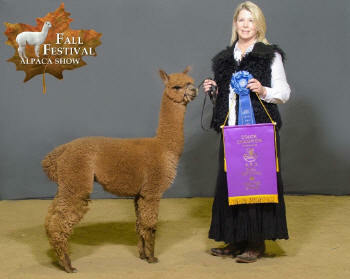 3rd Cria - Xanadu Aristide's Twice As Haute [Aristide daughter] 1st place Bred & Owned ’18 Fall Fest. 2nd place ’18 GWAS. 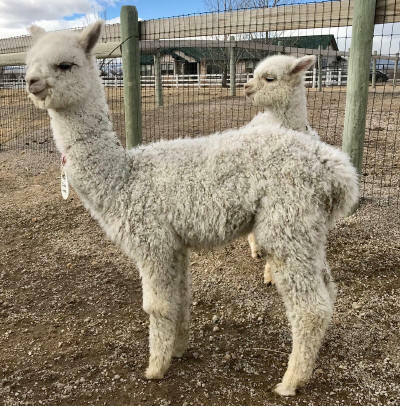 Breeding Status: Bred to Snowmass Loro Piana for a spring 2019 cria. Comments: She's the first of 8 full siblings. We like her a lot. 1st Place Produce of Dam ’10 GWAS show, Color Champion ‘07 GWAS, '06 Mid-America Jamboree and '07 TxOlan Show. 1st place '07 AOBA fleece show. Daughter of our 6X Color Champion Presidio daughter! 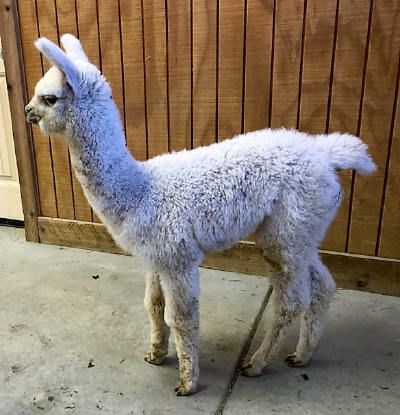 2nd Cria – Xanadu P. Allure [Foundation Herd] [PC Running Late girl.] 1st Place ’11 GWAS & 2nd Place AOBA Show. 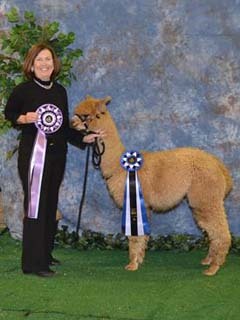 1st Place '11 Mid-America Show and ABR Fall Fest. 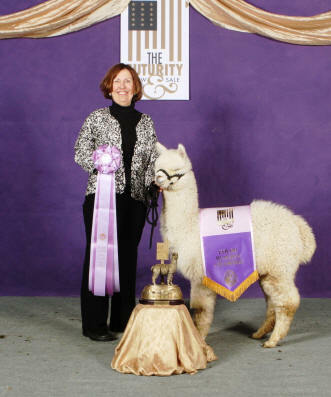 3rd Cria - Xanadu P Adorno [Snowstorm son] 1st place AOBA and '13 ABR Fall Fest and 2nd Place GWAS. 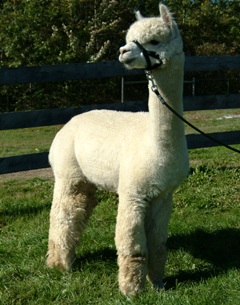 4th Cria - Xanadu P Aristide, [Snowstorm son] Judge's Choice, 10X Color Champ, 6 X Reserve & 20 blues. 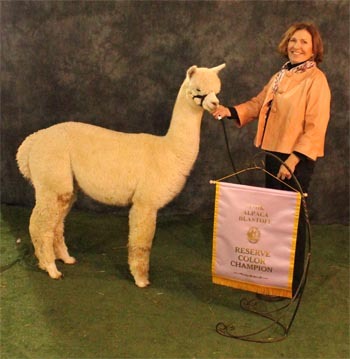 5th Cria - Xanadu P Althea [White Eastwind's Snowstorm girl] [Foundation Herd] CC and Judge’s Choice ’16 GWAS and 1st & CC '16 AOA Halter AND Fleece Show & 1st Place and Color Champion - 2016 TxOlan Show. 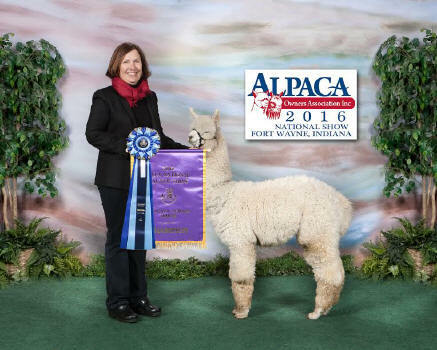 6th Cria - Xanadu Courant's Allouette [CCNF Legionnaire girl] 1st & RC Midwest Alpaca Fleece Show & RC ’18 AOK Blastoff. 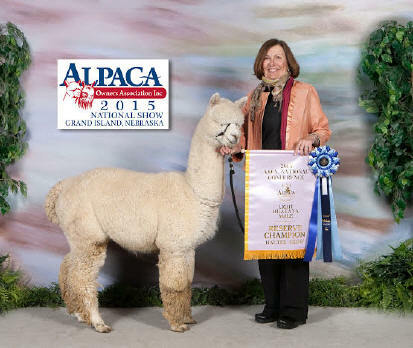 Allouette will be for sale at the Parade of Champions auction in June – bred to Snowmass Loro Piana. 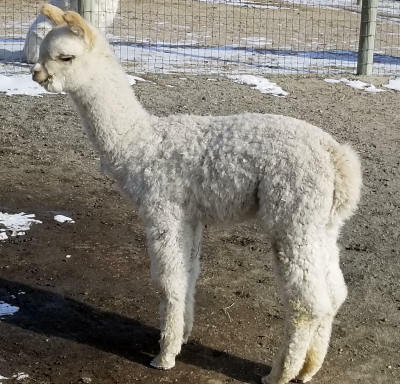 Breeding Status: Bred to Snowmass Loro Piana for a fall 2019 cria. Comments: We purchased this exceptional young female at the Futurity sale. 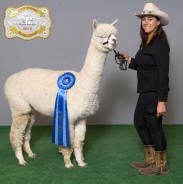 After the sale she took 1st Place in the '12 AAA Futurity. 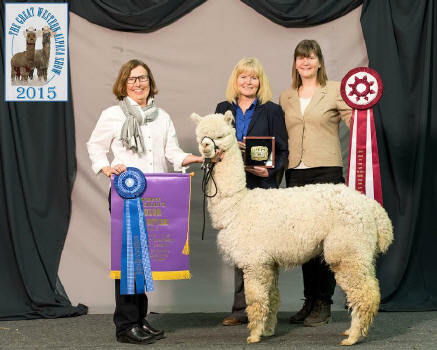 Judge's Choice Fleece, '13 GWAS and Reserve Champion Fleece '13 AOBA Nationals. 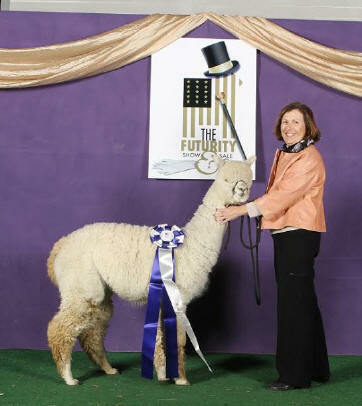 2nd Cria – Xanadu P Emblematic [Aristide girl] [Foundation Herd] 1st Place GWAS & Futurity. 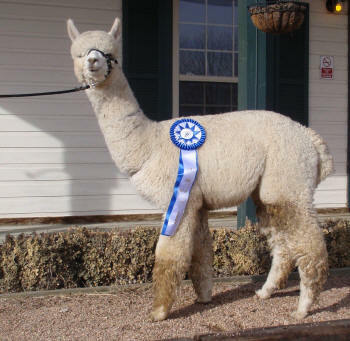 3rd Cria - Xanadu Nordic Saga [Aristide son] 1st Place ‘17 GWAS, 1st place and Reserve Champion ’17 A-OK & ’18 TxOlan. 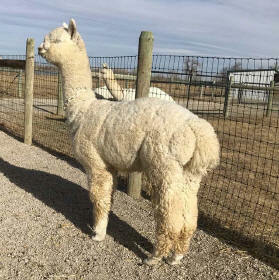 4th Cria - Xanadu Embolden [Snowmass Matrix son] We've added Embolden to our Alpacas for Sale Page. Comments: FULL SISTER #4 JOINS OUR FOUNDATION HERD. Talk about breeding true. Belle's given us 6 full sisters, all remarkably alike & beautiful & 5 of 6 are multiple CCs. 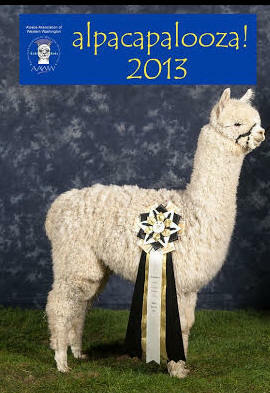 1st Cria - Xanadu Champagne Polarity [AA Polaris boy] 1st Place ’18 MoPaca Show. 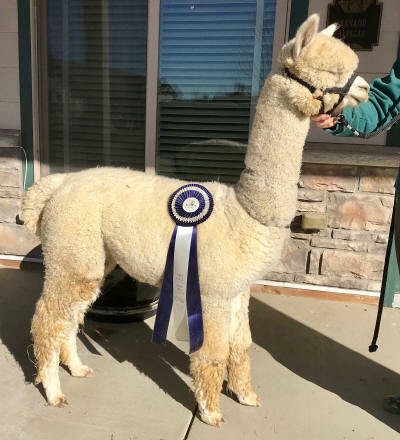 CC – Fleece ’18 ABR Fall Fest, 1st Place ’18 A- OK Show. 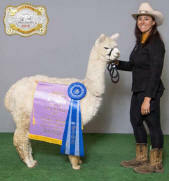 Comments: 1st Place ’09 AAA, Futurity, Color Champion ABR Fall Fest. 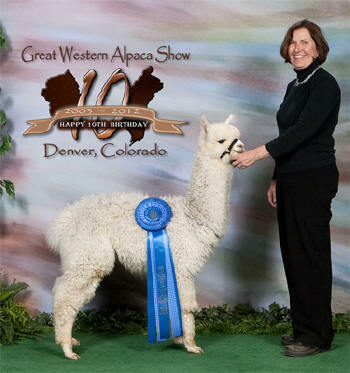 & '09 Mid-America Show, 1st Place 2010 AOBA Fleece Show & CC & Spirit of the Industry award '13 GWAS fleece show. Cachet joins her dam, Donno Bello and full sisters Au Courant, Cabriole and Caprice in our foundation lineup. 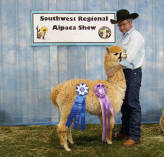 1st Cria - Xanadu P Bordelaise [Supernova girl] 1st Place and RC (1st Show) '12 SWRAS. 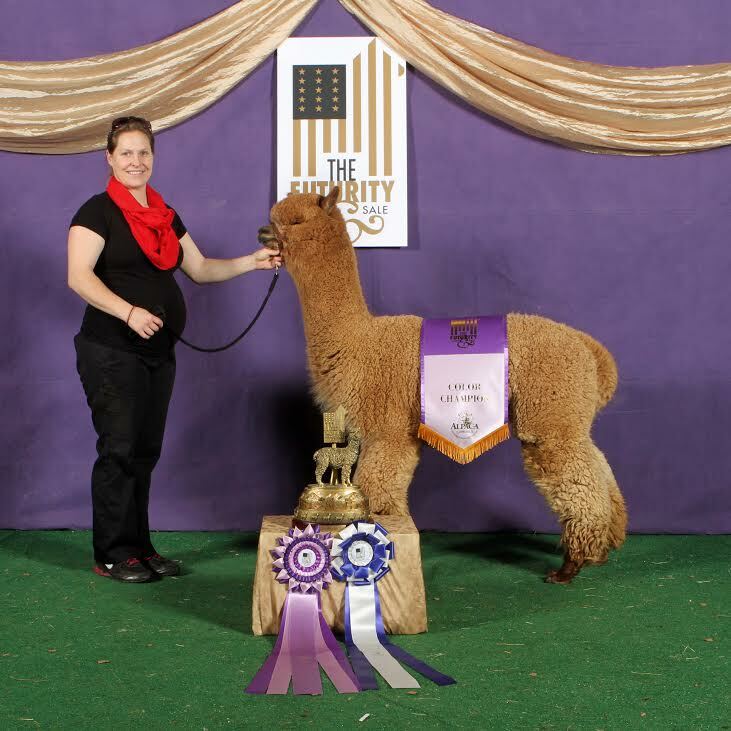 3rd Cria - Xanadu P Calidad [TGF Royal Tribute son] 1st B&O American Showcase '15 & 2nd Place '15 A-OK Blastoff. Fall Fest & A-OK Blastoff. Sold to Germany! 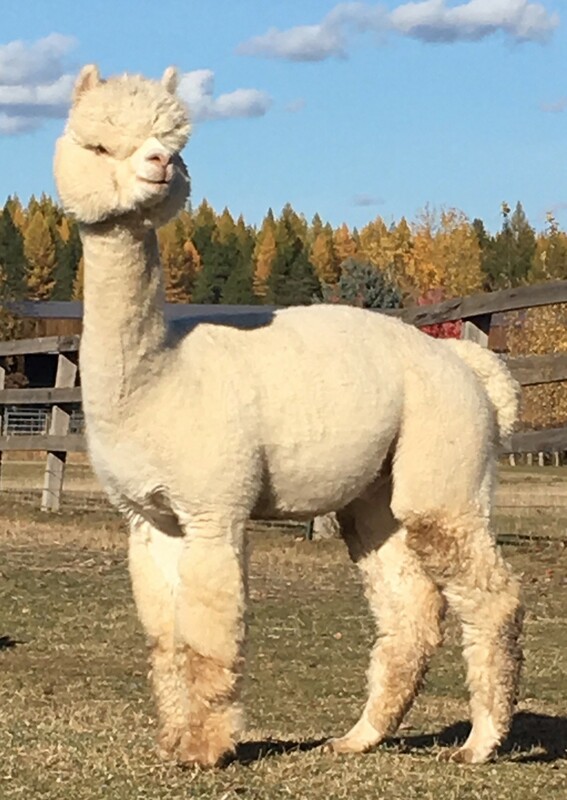 Comments: She is an automatic addition to our foundation herd as she's joined full sisters Au Courant, Cabriole and Cachet, and mom Donno Bello. 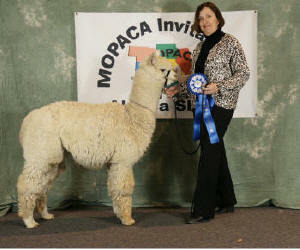 Blue Ribbon in class of 12 at ’11 MoPaca Show, and '11 GWAS. '11 CC MN Expo, '11 High Plains Show and '12 SWRAS. 1st Cria – Xanadu P Sojourner [Eastwinds's Snowstorm girl] 1st Place 2017 National Western Stock Show. 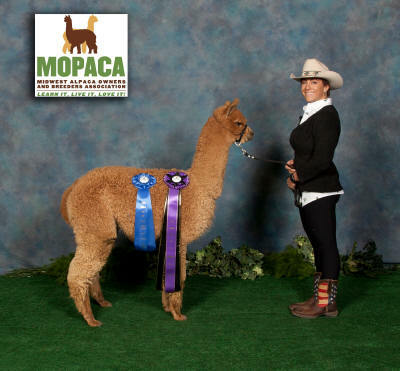 2nd Cria - Xanadu Keziah [FIA Rocky Bay girl] CC ’18 MoPaca Show, 1st Place ’18 TxOlan Show & GWAS, 2nd Place AAA Futurity. 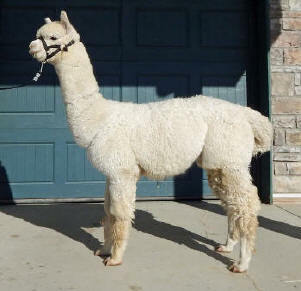 3rd Cria - Xanadu Davos [Red Granite’s Val D’Sere boy] 1st place halter ’19 MoPaca Show. We are offering a full or ½ interest for sale. 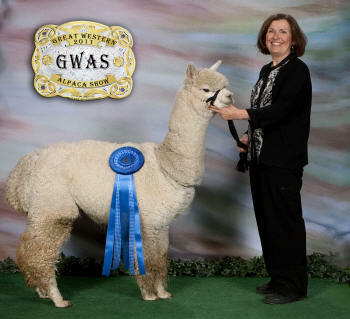 Comments: 1st Place ’11 GWAS Show, Mid-America Show and ABR Fall Fest. 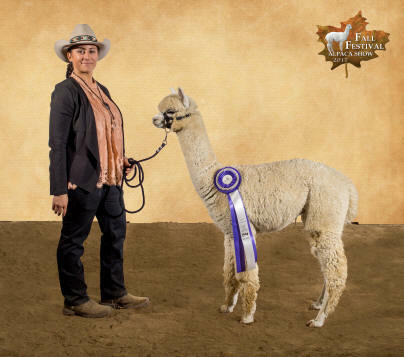 1st Cria – Xanadu P Etude [TGF Royal Tribute girl] CC & Judge's Choice '15 MoPaca AND '15 GWAS, CC Bred & Owned '15 AOA Nationals, RC '14 ABR Fall Fest & 1st 2015 AOA Fleece Show. 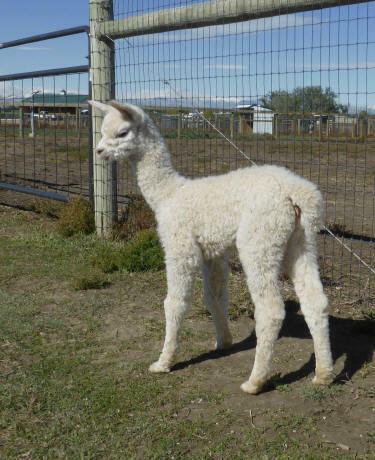 2nd Cria - Xanadu P Smitten [TGF Royal Tribute girl]. 1st place '15 GWAS, 1st Place ’15 A-OK Show & 1st '16 TxOlan Show. [Barnabus boy] CC & Judge’s Choice. 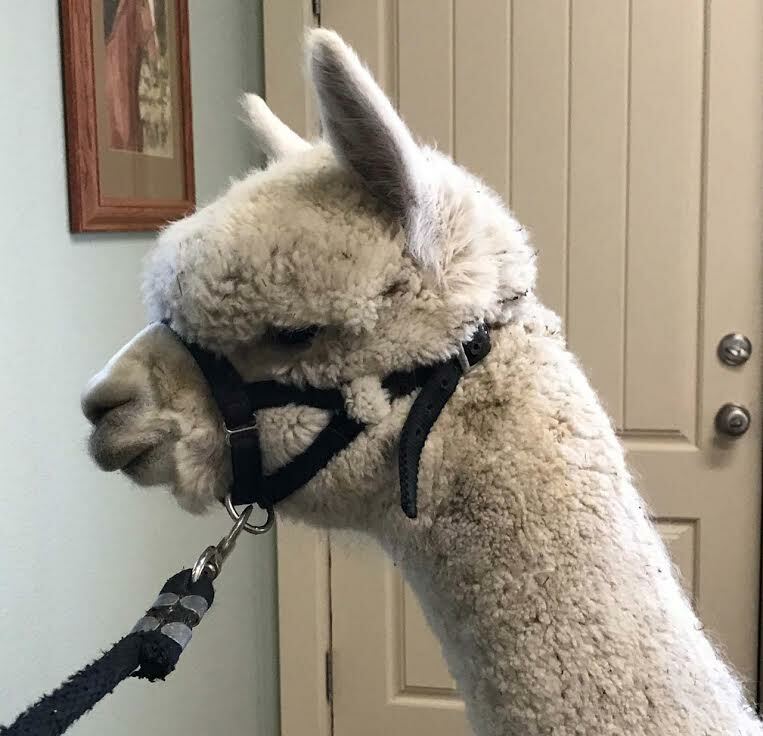 ’19 TxOlan Fleece Show. 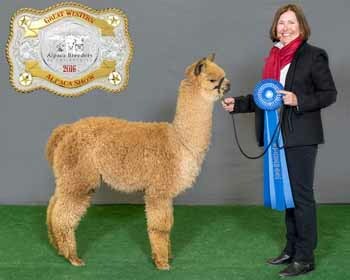 Breeding Status: Bred to multiple champion TGF Royal Tribute for a spring cria. Comments: Full sister to Adorno and Aristide and another WOW. 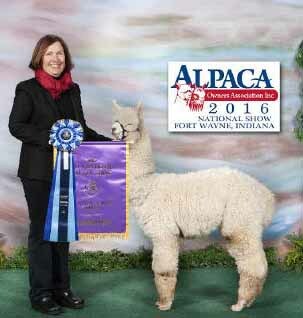 1st & Color Champion AOA ’16 Halter AND Fleece show, 1st , CC & Judges’ Choice ’16 GWAS, 1st & CC ’16 TxOlan. 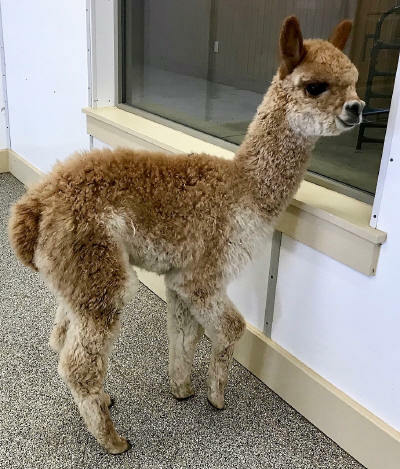 Breeding Status: Bred to the incomparable Snowmass Loro Piana for a fall 2019 cria. was a color champion for us. She's a Presidio daughter and Accoyo Legacy granddaughter and she’s been a star producer for us. 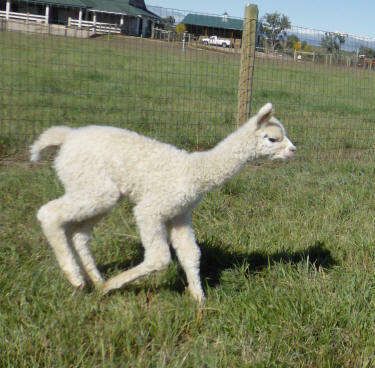 Aida’s first cria is an incredible Barnabus son, Brigadier. He’s in line to step into Dad’s shoes. 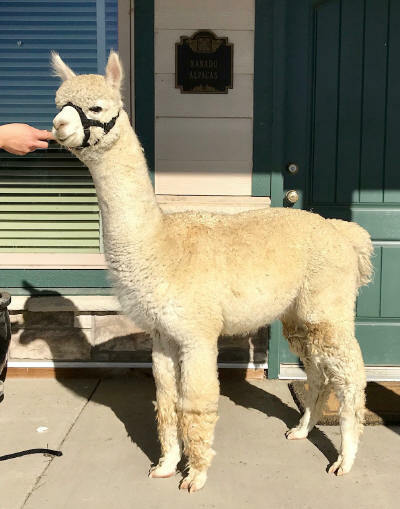 Breeding Status: Breeding back now to the incomparable Snowmass Loro Piana. Comments: 8 month histogram of 12.9, 2.4 SD, 18.5 CV & 0.2% + 30. That’s nearly a match for Barnabus at 12 months. 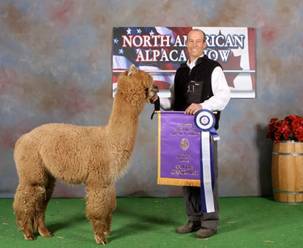 1st & CC '11 High Plains, 1st & RC '12 Illinois Show & 1st '12 ABR Fall Fest 1st and CC Bred & Owned '13 GWAS show. Add simply incredible density and brightness and you have one of the best we’ve ever produced. 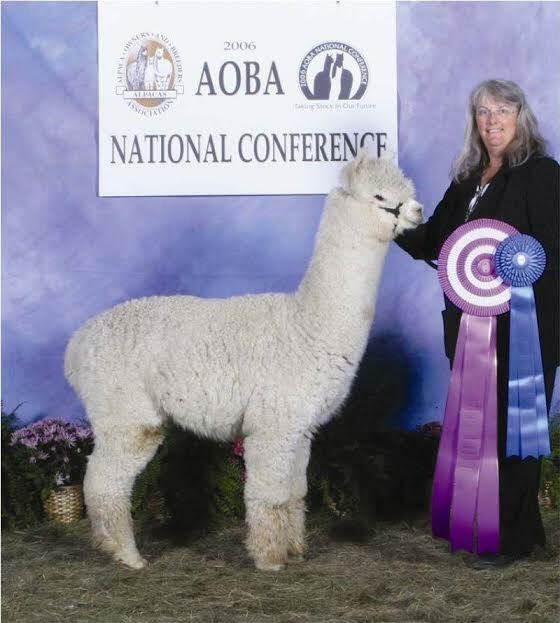 1st Cria - Xanadu P Rimbaud [Snowstorm son] 1st Place Bred & Owned '15 AOA National Show & MoPaca & 2015 GWAS Show, 1st Place White Yearling ’15 A-OK Show. 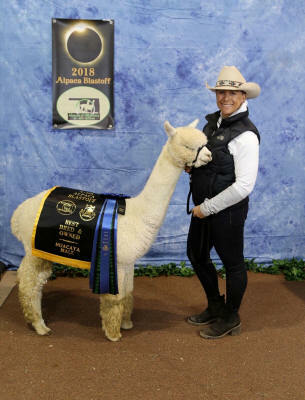 3rd Cria – Xanadu Anthem [Springtoo Skyfall boy] 1st place ’18 TxOlan, GWAS & MoPaca Show, 1st (class of 9) AOA Fleece Show, CC ’18 A-OK Show & CC and Judge’s Choice ABR Fall Fest. Sold to Germany! 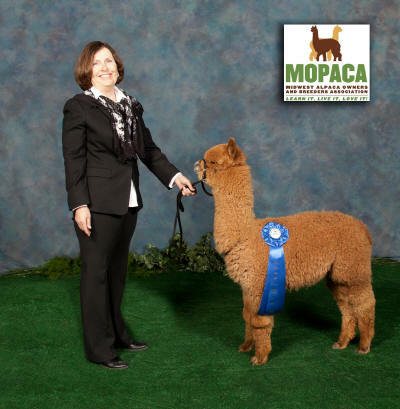 4th Cria - Xanadu Calvados [Xanadu P Aristide boy] 1st & CC ’19 MoPaca show. 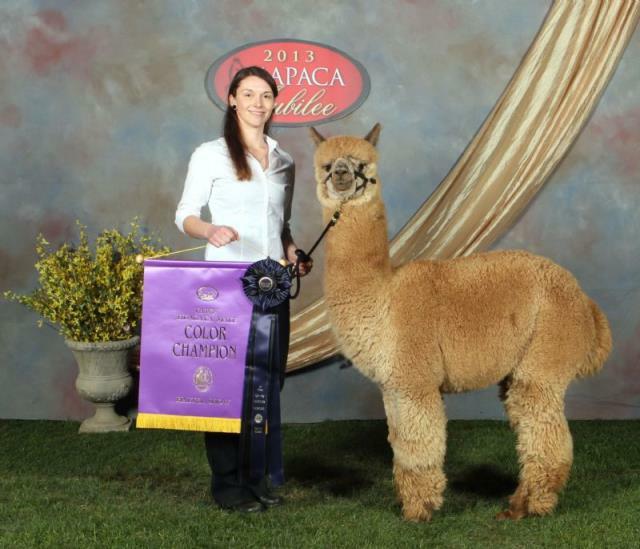 Comments: This Judges’ Choice and multiple champion female is another sparkling addition to our fawn line. 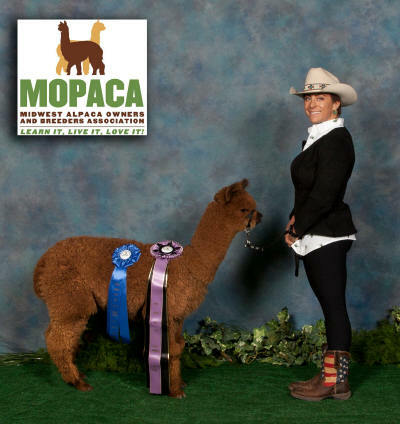 1st Cria - Xanadu Chasseur [Barnabus son] 1st Place and Color Champion Bred & Owned '18 MoPaca Show & ’18 A-OK Show. Sold to Germany! 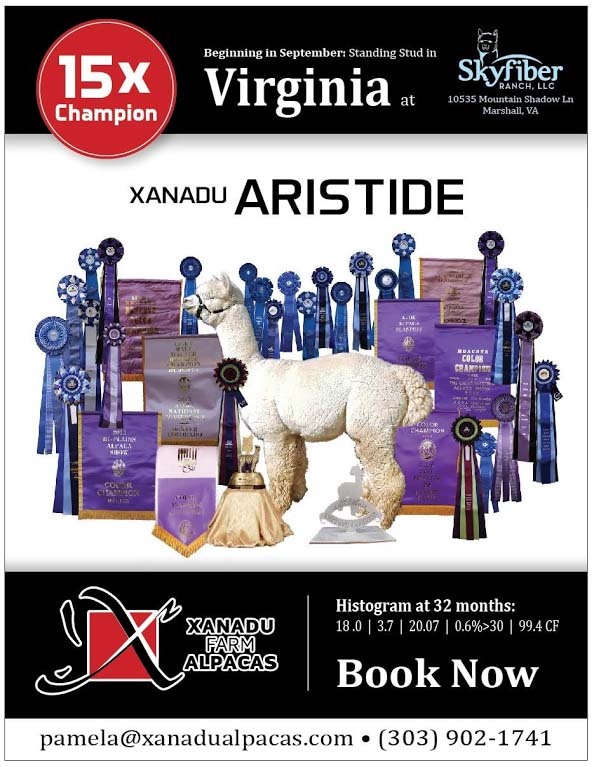 2nd Cria - Xanadu Aristide’s Velvet Revolution [Xanadu P Aristide girl] 1st Place & RC ’19 MoPaca show. 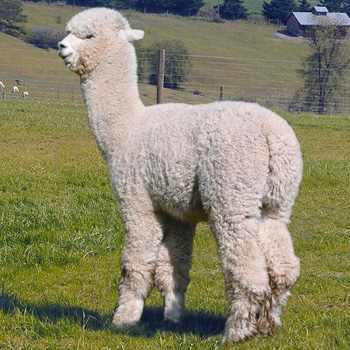 Breeding Status: Bred to Xanadu P Alchemist for a fall cria. 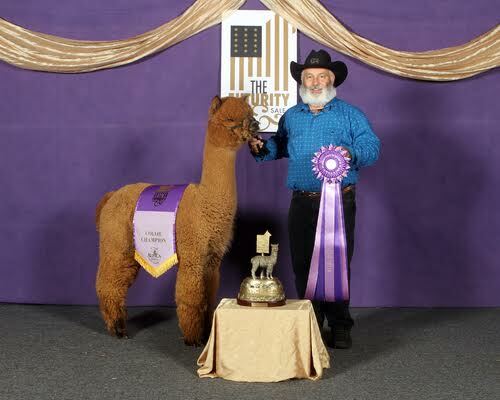 Comments: 1st Place and Color Champion in both Fleece and Halter at the '13 ABR Fall Fest, 1st Place 2014 AAA Futurity” and CC '14 GWAS Show, ’13 A-OK Blastoff and Hi Plains Show. 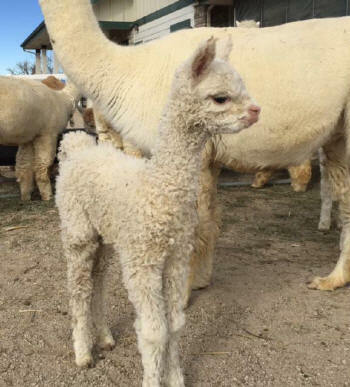 1st Cria –Xanadu P Alchemist [Snowmass Matrix son] [Xanadu Herdsire Row] Color Champion ’17 AOA show. Color Champion & Grand Champion male ’17 National Western Stock Show. 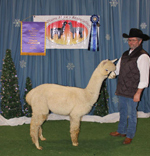 Color Champion ’16 Fall Fest, 17 TxOlan Show, MoPaca, and ’16 A-OK Blastoff, CC & Judge’s Choice ‘18A-OK Show. 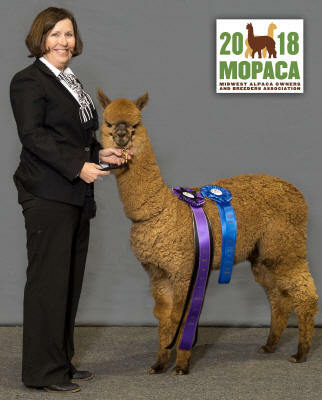 2nd Cria - Xanadu Nobel Bard [TGF Royal Tribute son] Color Champion Walking Fleece ’17 ABR Fall Fest & Reserve Champion Walking Fleece ’18 MoPaca Show (group of 36). 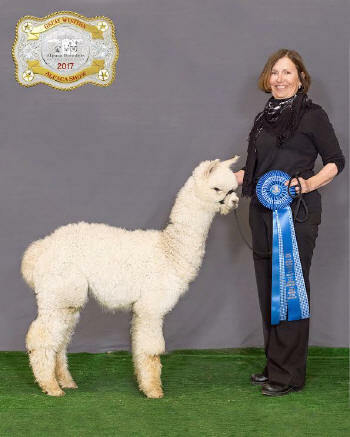 3rd Cria - Xanadu Ravello [TGF Royal Tribute son] 2nd place ’18 GWAS, & 1st Walking Fleece ’18 AOK Show. 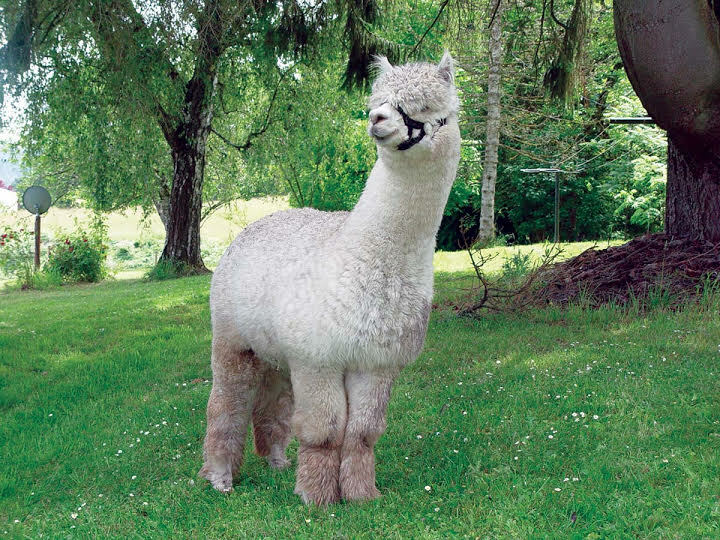 We've added Ravello to our Alpacas for Sale Page. 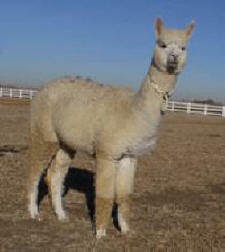 4th Cria - Xanadu Sorcerer [Snowmass Matrix son] Full brother to Alchemist . Comments: We were delighted by the opportunity to add this blue ribbon Beethoven's Dorian girl to our Foundation Moms. 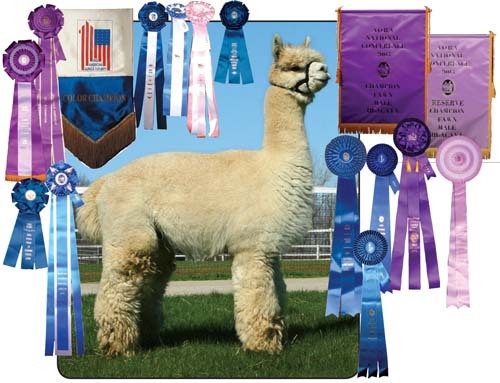 1st Cria - Xanadu P Champagne Protocol [Crystal's KO son]1st Place '16 AOA National Show & 1st Place - 2016 TxOlan Show, 1st Place ’16 MoPaca & GWAS and Best Hand, ’16 AOA Fleece Show “& CC ’17 National Western Stock Show -Fleece. 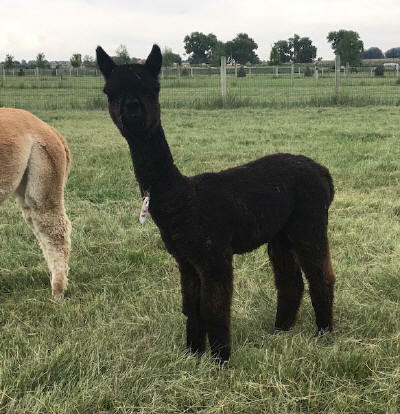 2nd Cria - Xanadu Night Moves [Xanadu P Aristide girl] A true black stunner. 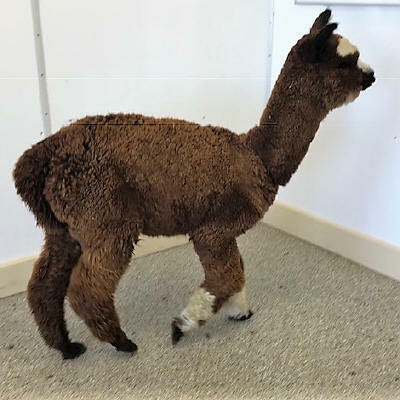 3rd Cria - Xanadu Bomber's Avatrix [Annual's Bea-2 Bomber daughter] We've added Avatrix to our Alpacas for Sale Page. 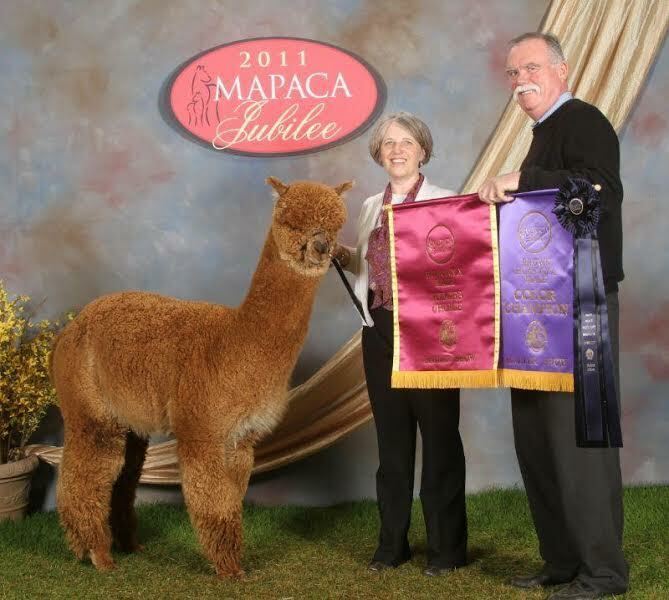 Comments: She carries an exceptionally dense fleece with good fineness & uniformity and dad’s head. 2nd year histogram: 16.2 mic, 3.1 SD, 19.3 CV, 0.4% + 30, 63.5 MC, & 99.6 CF. 1st Place ’18 AAA Futurity & GWAS. 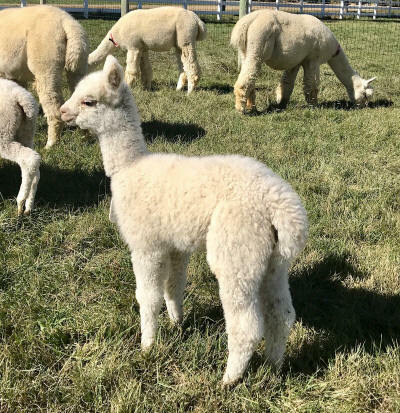 Breeding Status: Bred to 10 X Get of Sire winner Barnabus for a spring 2019 cria. 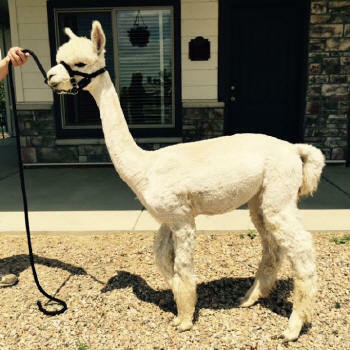 Comments: We purchased this ultrafine girl as the best alpaca in the Snowmass Auction '07. 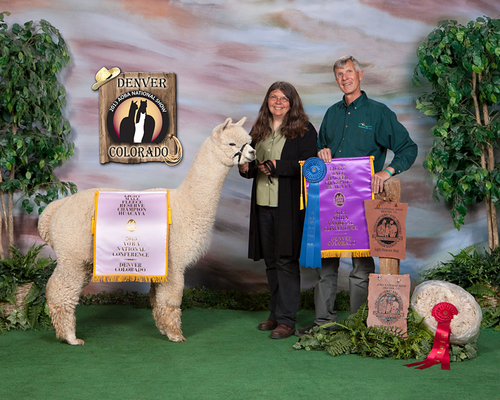 1st Cria - Snowmass P True North One [Snowmass Artic Wind son] 1st Place '09 MoPaca Show. 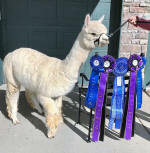 3rd Cria - Xanadu P Counterpoint [Barnabus son] 1st place & RC '11 Hi Plains Show and1st Place '11 ABR Fall Fest. 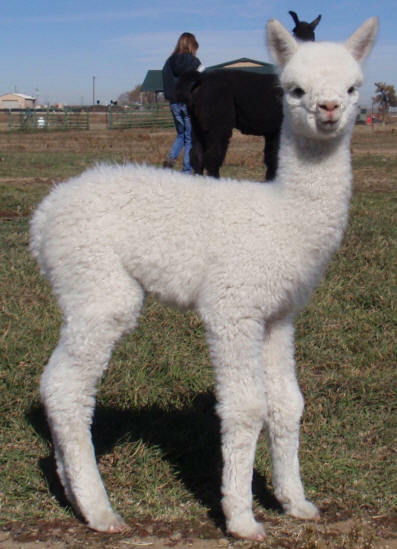 4th Cria - Xanadu P. High Cotton_ [Barnabus son]. First Place '12 GWAS. 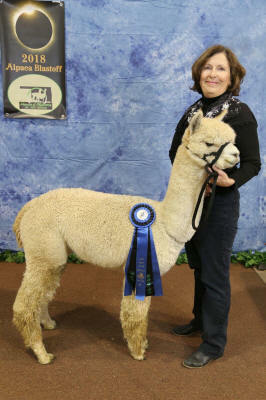 Exported as a herdsire to Canada and Color Champion Northlands Show @ 3 1/2. 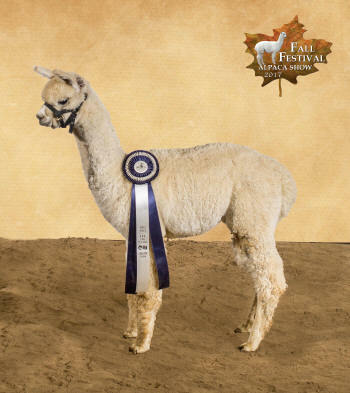 5th Cria - Xanadu P Intrigue [TGF Royal Tribute son], First Place ABR Fall Fest & Reserve Champion 2015 TxOlan Show. 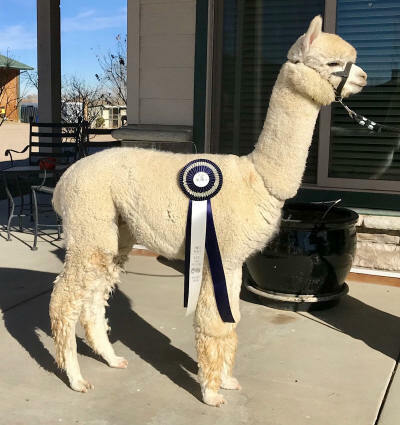 7th Cria - Xanadu P Souriant [Xanadu P Aristide girl] [Foundation Herd] CC AOA Walking Fleece, CC MoPaca Show, CC ’18 ABR Fall Fest, 1st Place '17 GWAS, Reserve Champion '17 A-OK Show & 1st Place ’18 TxOlan Show. [Rocky Bay son] 1st & CC ’19 MoPaca Show. 1st place B&O ’18 GWAS [class of 6] Color champion Fleece ’18 Midwest Fleece Show, & Reserve Champion ’18 A-OK Show. 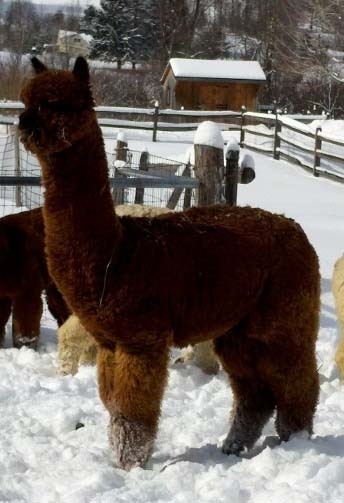 We've added Bourbon to our Alpacas for Sale Page. 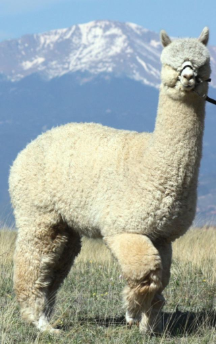 Breeding Status: Breeding to Snowmass Loro Piana this spring. 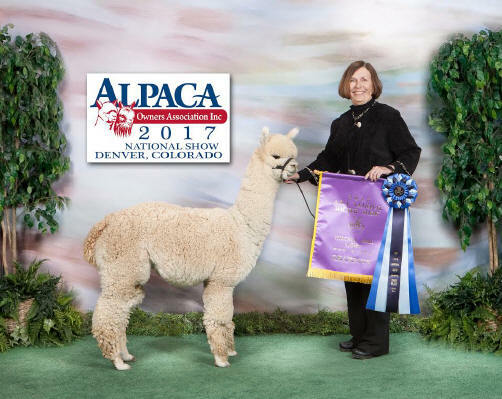 Comments: Our 1st Aristide cria in the ring @ 6 months old won the walking fleece Color Champion & 2nd in a large white juvie class at the 2017 AOA National Show . 1st ’17 GWAS & 1st & CC ’17 MoPaca, CC ’18 ABR Fall Fest, Reserve Champion ’17 A-OK Show, 1st place ’18 TxOlan Show. 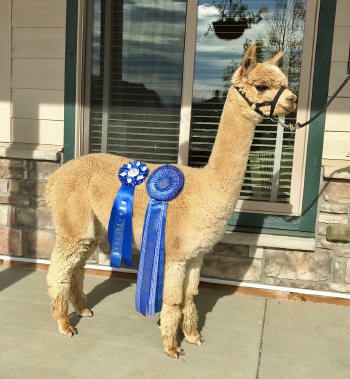 1st Place (class of 8) & “Best Crimp” ’18 AOA Fleece Show. Comments: This little girl had a bit of a rough start with a 1st time mom & we kept her home to make sure she grew up strong. Simply sensational in every way.